Palmistry or Chiromancy is the art of characterization, deciphering meanings for analyzing potential abilities, inherent nature, and predicting the future through the study of the palm. It is also known as palm-reading, chirology or hand analysis. While palm reading is a general term that refers to numerous ways to interpret the hands, chiromancy refers only to the divinatory use of palm reading. Interpreting the lines in the palm was, for many years, the only known form, or at the very least, the most well known form, of palmistry. The practice is found all over the world, with numerous cultural variations. Those who practice chiromancy are generally called palmists, palm readers, hand readers, hand analysts, or chirologists. Fundamental to Vedic palmistry, is that as we continuously change and evolve, so do the hand lines on our palms. By studying both hands - the non-dominant hand (past) and dominant hand (present) - we can recognize the traceable link between our past behavioral patterns and our present personality, thoughts and experiences. With this understanding, we can shape our future in a constructive, fulfilling way, making positive choices regarding our work, our dealings with people around us, and many other important aspects of life. Palmistry can trace its roots back to Indian (Hindu) Astrology (known in Sanskrit as Jyotish) and Roma (gypsy) fortune tellers. The Hindu sage Valmiki is thought to have written a book, whose title translates in English as "The Teachings of Valmiki Maharshi on Male Palmistry", comprising 567 stanzas, more than 5,000 years ago. From India, the art of palmistry spread to China, Tibet, Egypt, Persia and to other countries in Europe. 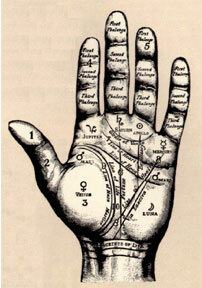 Palmistry came to China in around 3,000 B.C. It then progressed to Greece where Anaxagoras practiced it. However, modern palmists often combine traditional predictive techniques with psychology, holistic healing, and alternative methods of divination. Chirognomy was introduced in France in the 1800s by Captain Casimir Stanislas D'Arpentigny. He realized that hands could be grouped according to their shape and size. He created the following classifications: square, spatulate, psychic, knotty, and philosophic. The many hands that do not fit into one classification are considered mixed hands. He also realized that people who share hand shapes also share many personality qualities. He paved the way for a whole new system of palm interpretation. Other palmists have since included skin texture, color, finger length, nail quality, etc. as a means to more accurately interpret a person's palm. The practice of chiromancy is generally regarded as a pseudoscience. It should be noted that the information outlined below is briefly representative of modern palmistry; there are many, often conflicting, interpretations of various lines and palmar features across various "schools" of palmistry. Chiromancy consists of the practice of evaluating a person's character or future life by "reading" the palm of that person's hand. Various "lines" ("heart line", "life line", etc.) and "mounts" (or bumps) (chirognomy), purportedly suggest interpretations by their relative sizes, qualities, and intersections. In some traditions, readers also examine characteristics of the fingers, fingernails, fingerprints and palmar skin patterns (dermatoglyphics), skin texture and color, shape of the palm, and flexibility of the hand. A reader usually begins by reading the person's 'dominant hand' (the hand he or she writes with or uses the most). In some traditions of palmistry, the other hand is believed to carry past-life or karmic information, as well as hereditary traits.